I prefer the candy holidays to the drinking holidays and there’s no bigger candy holiday than Halloween. 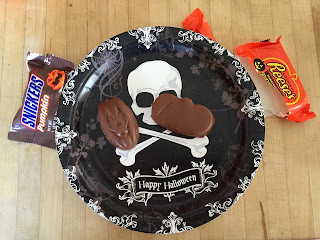 It’s all about candy (well, that and devil worship) so you not only get all the regular candy that’s available the rest of the year but they also roll out the specialty stuff. We’ve already talked about my love for the Reese’s Peanut Butter Pumpkin. Now Snickers has a pumpkin of their own. Oh snap! It’s time for a pumpkin fight. Let’s get it on! Okay. That’s too much build up. It’s not like there’s anything all that exciting going on here. I’m just taking bites and writing about them. But which one won? Obviously it’s subjective and Reese’s Peanut Butter Pumpkins are my favorite candy of all time. If I’m the judge it’s not a fair fight. For me, Reese’s vs. Snickers is like Rhonda Rousey vs. anybody. But I can tell you a little about the Snickers Pumpkin. They look much better than the Reese’s pumpkin. Much better. 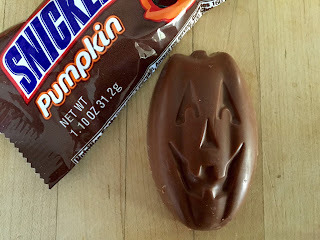 If you like your candy pumpkins to look like a cartoon jack-o-lantern and not like weird blobs then pick the Snickers. And honestly the Snickers packaging looks better, too. But what about the taste? It’s thinner than the regular Snickers candy bar. You get less filling and more chocolate. If you think you might like that ratio then you should give them a shot but I think the mix is off. The Snickers Pumpkin looks great walking out but once the introduction is over and the cage door shuts, it’s a massacre. Reese's wins.